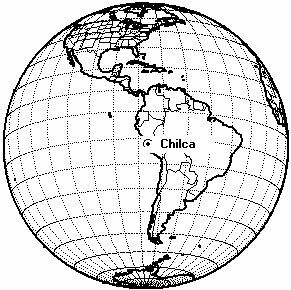 Chilca Launch Range. Sounding rocket launch location. First Launch: 1974-03-29. Last Launch: 1983-03-23. Number: 60 . Location: Lima. Longitude: -76.80 deg. Latitude: -12.50 deg. Family: Suborbital Launch Site, Tomahawk Sandia. Country: Peru. Launch Vehicles: Nike Nike, Nike Apache, Nike Tomahawk, Super Arcas, Super Loki, Castor (A), Black Brant IVB. Bibliography: 2. 1975 May 24 - . 01:00 GMT - . Launch Site: Chilca. LV Family: Tomahawk. Launch Vehicle: Nike Tomahawk. Plasma mission - . Nation: USA. Agency: NASA. Apogee: 338 km (210 mi). 1975 May 24 - . 01:05 GMT - . Launch Site: Chilca. LV Family: Arcas. Launch Vehicle: Super Arcas. Plasma mission - . Nation: USA. Agency: NASA. Apogee: 93 km (57 mi). 1975 May 24 - . 01:52 GMT - . Launch Site: Chilca. LV Family: Arcas. Launch Vehicle: Super Arcas. Aeronomy mission - . Nation: USA. Agency: NASA. Apogee: 71 km (44 mi). 1975 May 24 - . 06:55 GMT - . Launch Site: Chilca. LV Family: Tomahawk. Launch Vehicle: Nike Tomahawk. Plasma mission - . Nation: USA. Agency: NASA. Apogee: 324 km (201 mi). 1975 May 24 - . 07:05 GMT - . Launch Site: Chilca. LV Family: Arcas. Launch Vehicle: Super Arcas. Plasma mission - . Nation: USA. Agency: NASA. Apogee: 91 km (56 mi). 1975 May 24 - . 07:44 GMT - . Launch Site: Chilca. LV Family: Arcas. Launch Vehicle: Super Arcas. Aeronomy mission - . Nation: USA. Agency: NASA. Apogee: 88 km (54 mi). 1975 May 24 - . 08:42 GMT - . Launch Site: Chilca. LV Family: Arcas. Launch Vehicle: Super Arcas. Aeronomy mission - . Nation: USA. Agency: NASA. Apogee: 67 km (41 mi). 1975 May 24 - . 14:24 GMT - . Launch Site: Chilca. Launch Vehicle: Super Loki. Aeronomy mission - . Nation: USA. Agency: NASA. Apogee: 70 km (43 mi). 1975 May 24 - . 19:00 GMT - . Launch Site: Chilca. Launch Vehicle: Super Loki. 1975 May 25 - . 19:44 GMT - . Launch Site: Chilca. Launch Vehicle: Super Loki. Aeronomy mission - . Nation: USA. Agency: NASA. Apogee: 69 km (42 mi). 1975 May 27 - . Launch Site: Chilca. LV Family: Deacon. Launch Vehicle: Nike Apache. Aeronomy mission - . Nation: USA. Agency: NASA. Apogee: 127 km (78 mi). 1975 May 27 - . 08:01 GMT - . Launch Site: Chilca. LV Family: Deacon. Launch Vehicle: Nike Apache. 1975 May 28 - . 19:30 GMT - . Launch Site: Chilca. LV Family: Arcas. Launch Vehicle: Super Arcas. Plasma mission - . Nation: USA. Agency: NASA. Apogee: 86 km (53 mi). 1975 May 28 - . 20:26 GMT - . Launch Site: Chilca. LV Family: Deacon. Launch Vehicle: Nike Apache. Plasma mission - . Nation: USA. Agency: NASA. Apogee: 191 km (118 mi). 1975 May 28 - . 21:16 GMT - . Launch Site: Chilca. LV Family: Arcas. Launch Vehicle: Super Arcas. Plasma mission - . Nation: USA. Agency: NASA. Apogee: 82 km (50 mi). 1975 May 29 - . 03:55 GMT - . Launch Site: Chilca. LV Family: Deacon. Launch Vehicle: Nike Apache. Aeronomy mission - . Nation: USA. Agency: NASA. Apogee: 131 km (81 mi). 1975 May 30 - . 04:35 GMT - . Launch Site: Chilca. LV Family: Deacon. Launch Vehicle: Nike Apache. Plasma mission - . Nation: USA. Agency: NASA. Apogee: 187 km (116 mi). 1975 June 2 - . 05:11 GMT - . Launch Site: Chilca. LV Family: Deacon. Launch Vehicle: Nike Apache. 1975 June 3 - . 16:14 GMT - . Launch Site: Chilca. LV Family: Tomahawk. Launch Vehicle: Nike Tomahawk. FAILURE: Failure. Plasma mission - . Nation: USA. Agency: NASA. Apogee: 20 km (12 mi). 1975 June 3 - . 16:41 GMT - . Launch Site: Chilca. LV Family: Deacon. Launch Vehicle: Nike Apache. Aeronomy mission - . Nation: USA. Agency: NASA. Apogee: 204 km (126 mi). 1975 June 7 - . 16:07 GMT - . Launch Site: Chilca. LV Family: Tomahawk. Launch Vehicle: Nike Tomahawk. Plasma mission - . Nation: USA. Agency: NASA. Apogee: 259 km (160 mi). 1975 June 7 - . 16:25 GMT - . Launch Site: Chilca. LV Family: Deacon. Launch Vehicle: Nike Apache. Aeronomy mission - . Nation: USA. Agency: NASA. Apogee: 197 km (122 mi). 1979 March 21 - . 23:49 GMT - . Launch Site: Chilca. LV Family: Rigel. Launch Vehicle: Castor (A). FAILURE: Failure. Spread F Barium release mission - . Nation: Germany. Agency: DFVLR. Apogee: 0 km (0 mi). 1979 March 22 - . 23:53 GMT - . Launch Site: Chilca. LV Family: Rigel. Launch Vehicle: Castor (A). Spread F Barium release mission - . Nation: Germany. Agency: DFVLR. Apogee: 268 km (166 mi). 1983 February 27 - . 16:33 GMT - . Launch Site: Chilca. Launch Complex: Chilca PLOB. LV Family: Hawk. Launch Vehicle: Nike Orion. Project Condor Plasma mission - . Nation: USA. Agency: NASA. Apogee: 140 km (80 mi). 1983 March 2 - . 02:51 GMT - . Launch Site: Chilca. Launch Complex: Chilca PLOB. LV Family: Malemute. Launch Vehicle: Terrier Malemute. CONDOR Plasma mission - . Nation: USA. Agency: NASA. Apogee: 590 km (360 mi). 1983 March 3 - . 03:54 GMT - . Launch Site: Chilca. Launch Complex: Chilca PLOB. LV Family: Hawk. Launch Vehicle: Taurus Orion. Project Condor Plasma mission - . Nation: USA. Agency: NASA. Apogee: 200 km (120 mi). 1983 March 8 - . 15:15 GMT - . Launch Site: Chilca. Launch Complex: Chilca PLOB. Launch Vehicle: Super Loki. CONDOR Aeronomy mission - . Nation: USA. Agency: NASA. Apogee: 82 km (50 mi). 1983 March 8 - . 16:35 GMT - . Launch Site: Chilca. Launch Complex: Chilca PLOB. LV Family: Hawk. Launch Vehicle: Nike Orion. 1983 March 8 - . 17:16 GMT - . Launch Site: Chilca. Launch Complex: Chilca PLOB. LV Family: Arcas. Launch Vehicle: Super Arcas. Plasma mission - . Nation: USA. Agency: NASA. Apogee: 80 km (49 mi). 1983 March 8 - . 19:17 GMT - . Launch Site: Chilca. Launch Complex: Chilca PLOB. Launch Vehicle: Super Loki. CONDOR Aeronomy mission - . Nation: USA. Agency: NASA. Apogee: 65 km (40 mi). 1983 March 8 - . 22:00 GMT - . Launch Site: Chilca. Launch Complex: Chilca PLOB. LV Family: Arcas. Launch Vehicle: Super Arcas. 1983 March 8 - . 23:27 GMT - . Launch Site: Chilca. Launch Complex: Chilca PLOB. LV Family: Arcas. Launch Vehicle: Super Arcas. 1983 March 9 - . 01:00 GMT - . Launch Site: Chilca. Launch Complex: Chilca PLOB. LV Family: Arcas. Launch Vehicle: Super Arcas. 1983 March 9 - . 02:25 GMT - . Launch Site: Chilca. Launch Complex: Chilca PLOB. Launch Vehicle: Super Loki. CONDOR Sphere - . Nation: Peru. Agency: NASA. Apogee: 80 km (49 mi). 1983 March 9 - . 02:38 GMT - . Launch Site: Chilca. Launch Complex: Chilca PLOB. Launch Vehicle: Super Loki. 1983 March 9 - . 03:06 GMT - . Launch Site: Chilca. Launch Complex: Chilca PLOB. LV Family: Hawk. Launch Vehicle: Nike Orion. 1983 March 9 - . 03:27 GMT - . Launch Site: Chilca. Launch Complex: Chilca PLOB. LV Family: Hawk. Launch Vehicle: Nike Orion. 1983 March 9 - . 03:52 GMT - . Launch Site: Chilca. Launch Complex: Chilca PLOB. Launch Vehicle: Super Loki. CONDOR Aeronomy mission - . Nation: USA. Agency: NASA. Apogee: 81 km (50 mi). 1983 March 9 - . 05:00 GMT - . Launch Site: Chilca. Launch Complex: Chilca PLOB. Launch Vehicle: Super Loki. 1983 March 9 - . 05:20 GMT - . Launch Site: Chilca. Launch Complex: Chilca PLOB. Launch Vehicle: Super Loki. 1983 March 9 - . 05:32 GMT - . Launch Site: Chilca. Launch Complex: Chilca PLOB. Launch Vehicle: Super Loki. Aeronomy mission - . Nation: USA. Agency: NASA. Apogee: 79 km (49 mi). 1983 March 9 - . 05:49 GMT - . Launch Site: Chilca. Launch Complex: Chilca PLOB. Launch Vehicle: Super Loki. 1983 March 9 - . 06:10 GMT - . Launch Site: Chilca. Launch Complex: Chilca PLOB. Launch Vehicle: Super Loki. 1983 March 9 - . 07:46 GMT - . Launch Site: Chilca. Launch Complex: Chilca PLOB. Launch Vehicle: Super Loki. Aeronomy mission - . Nation: USA. Agency: NASA. Apogee: 80 km (49 mi). 1983 March 9 - . 08:20 GMT - . Launch Site: Chilca. Launch Complex: Chilca PLOB. Launch Vehicle: Super Loki. 1983 March 9 - . 08:57 GMT - . Launch Site: Chilca. Launch Complex: Chilca PLOB. LV Family: Hawk. Launch Vehicle: Nike Orion. 1983 March 9 - . 09:20 GMT - . Launch Site: Chilca. Launch Complex: Chilca PLOB. Launch Vehicle: Super Loki. Aeronomy mission - . Nation: USA. Agency: NASA. Apogee: 85 km (52 mi). 1983 March 9 - . 10:11 GMT - . Launch Site: Chilca. Launch Complex: Chilca PLOB. LV Family: Arcas. Launch Vehicle: Super Arcas. 1983 March 9 - . 12:00 GMT - . Launch Site: Chilca. Launch Complex: Chilca PLOB. LV Family: Arcas. Launch Vehicle: Super Arcas. 1983 March 12 - . 15:35 GMT - . Launch Site: Chilca. Launch Complex: Chilca PLOB. LV Family: Hawk. Launch Vehicle: Taurus Orion. 1983 March 12 - . 17:09 GMT - . Launch Site: Chilca. Launch Complex: Chilca PLOB. LV Family: Hawk. Launch Vehicle: Nike Orion. 1983 March 21 - . 09:53 GMT - . Launch Site: Chilca. Launch Complex: Chilca PLOB. LV Family: Tomahawk. Launch Vehicle: Taurus Tomahawk. Project Condor Plasma mission - . Nation: USA. Agency: NASA. Apogee: 500 km (310 mi). 1983 March 23 - . 09:50 GMT - . Launch Site: Chilca. Launch Complex: Chilca PLOB. LV Family: Tomahawk. Launch Vehicle: Taurus Tomahawk. 1983 March 23 - . 18:52 GMT - . Launch Site: Chilca. Launch Complex: Chilca PLOB. Launch Vehicle: Super Loki. Aeronomy mission - . Nation: USA. Agency: NASA. Apogee: 78 km (48 mi).